This is a transcript of an extensive Glasgow Games Monitor 2014 interview with carers from the East End Carers group/Save the Accord campaign. The Accord centre was a day care centre for young adults with severe learning difficulties that has now been demolished to make way for a bus park for the Commonwealth Games 2014. No adequate replacement has since been made available. 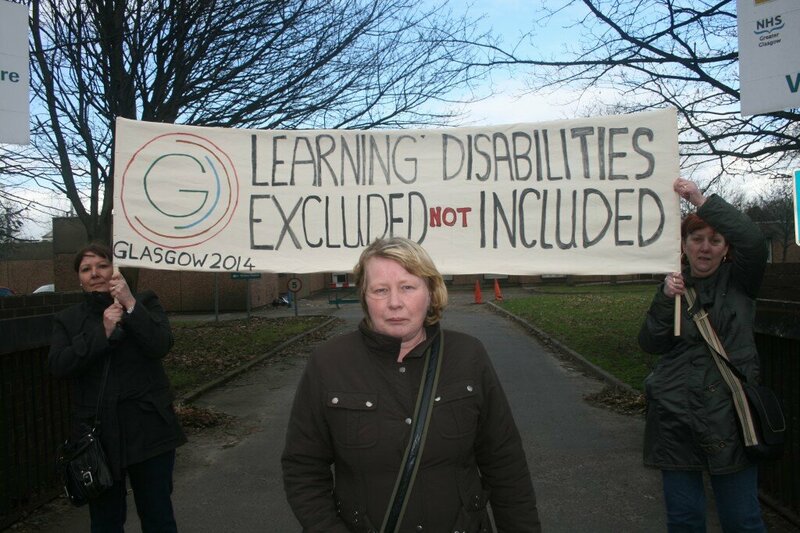 The East End of Glasgow currently has no stable and sustainable facilities for learning disabled people. Carers and users from the Accord centre describe in detail the history of their campaign, providing an important corrective to the misinformation produced by Glasgow City Council. They also voice the negative impact of ‘modernisation’ policies of ‘self-directed support’ (SDS) and personalisation on service users and their carers, and their personal thoughts on the supposed benefits of urban regeneration due to the Games and the Clyde Gateway development projects. Key points in the interview include a description of how Glasgow City Council have attempted to change the goalposts of the Accord campaign – saying that the Accord centre was not removed because of the Commonwealth Games, but because of the ‘modernisation’ of day services. This is contradicted by previous letters from the City Council here and here that explicitly state that the Accord centre was being closed to make way for the Games. The carers also discuss in detail the obvious inadequacy of the Bambury Centre as a replacement for the Accord centre, and the (cynical) reasons why they think the Council has chosen this option – despite the protests of carers. Cheryl McCarthur, a service user with Downs Syndrome, describes her personal feelings of sadness about the closure of the Accord, and the way the closure has drastically impacted her, and her friends, social life. The carers also discuss how the campaign has changed them as people, and how their eyes have been opened to the way that politicians operate in the city of Glasgow. Overall, this is a story of false promises by politicians of all stripes. Any claim of a positive ‘legacy’ from the Games, will always be countered by the shocking treatment meted out to the users and carers of the Accord centre, displaced by a bus park for the Commonwealth Games 2104. It’s not too late for the City Council and the Scottish Government to sort this mess out. If they don’t, East End carers, the Glasgow Games Monitor 2014, and many others, will continue to pour scorn on the notion of a positive Games legacy. Q. [GM]: Can you say something about the origins of the Save the Accord campaign? [GH]: I think it was 2007, 2008, carers got together in the Accord Centre, to start up a carers group. We had a visit from the then Director of Health and Social Care, Mark Feinman. And he came to a carers meeting and said that there was £250,000 available for a new centre; for a new Accord Centre. Because they’d already closed the Tollcross Centre, and the people from the Tollcross Centre moved down to the Accord. So it was full, bursting at the seams. So he asked the carers to look for land and stuff like that, and they were involved; well, he says they were looking as well, to find somewhere to build a new centre. Then, I don’t know how long after that, we had a couple of meetings with them, and next minute the Director of Health and Social Care turned up at a meeting with Jim Coleman [Labour Party councillor], and told us that the money is no longer there. But Jim Coleman said, as we’re getting the Commonwealth Games, you know, there’ll be a legacy for a day centre within the Commonwealth Games. So, we felt good about that. Then the Commonwealth Games stuff, well, obviously the Council were dead busy with all that. And they said they would get in contact with us, and I think we waited two years to see, you know, what’s happening, sort of thing. And we had a meeting with Raymond Bell [Head of Mental Health and Adult Support & Protection], and Raymond Bell says, no, you are no getting anything from the Commonwealth Games. [GH]: We’d waited, and waited. Because they said it would take time, because they were so busy and stuff. And we were absolutely shattered at that meeting. Because the two years had went by, after Glasgow got the Commonwealth Games, and we’re sitting waiting, thinking they’ll be working on something. You know, they’ll be looking into this, that or the next thing. Because that’s what they told us they’d be doing. And then when that happened, we just were absolutely shattered. Absolutely – all that time, just sat there. Q. [GM]: So, what then? How did you respond after that? What was your plan from then on? 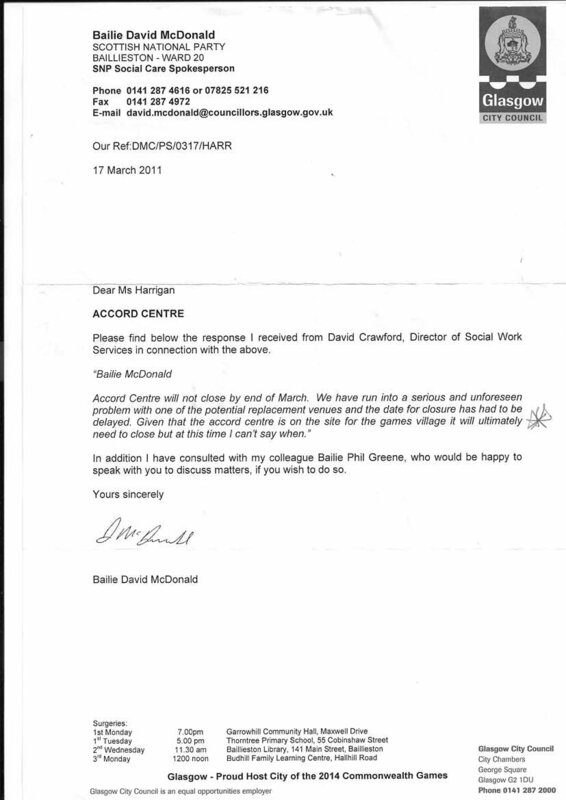 [GH]: After that, we wrote to…the new Director of Social Work became David Crawford. We wrote to him, and we wrote to…I think it was our councillor at the time …and the letters were coming back saying the Accord was closing because of the Commonwealth Games, because they’d acquired the land. And then suddenly the letters started saying, no, the Accord is closing because of modernisation. They started changing their mind why they were closing it. So, from there, because of the Commonwealth Games, we started writing to the Government. What happened then? Obviously we had loads of carers meetings, and carers were really angry. And then the Council and Social Work started talking about Self-Directed Support and stuff I think…us carers believed they just totally lied to us, to keep us…they told us nothing, when they knew all along we had this belief, because that’s what they told us. We had no reason not trust what they were telling us. Q. [GM]: Did you feel at that time that in a way they were basically changing the goalposts. So on the one hand they were saying that the Commonwealth Games is coming, and that was what was forcing the change. And then on the other hand they say, no, no, now this is about Self-Directed Support, and modernisation. [GH]: And then, and then obviously because of the way that money’s all went everywhere, you know – well, the banks and all that kind of thing happened, and it’s because of that, they just can’t make up their minds. Q. [GM]: So have they been talking about, have they said that about the financial climate? They said that in discussions? [GH]: Yes, yes. It’s in letters, they were mentioning the financial climate, and stuff like that, from the Council. [GH]: When the money went missing, we said, right, where’s the money, then? Where did the money go? And they’re like, it’s not to do with money, it’s modernisation. Because the money disappeared! [incredulous laughter] You know? Do you see what I’m saying? [GH]: They will say to people, the Accord had nothing to do with the Commonwealth Games. We have letters from the Council, saying the land was required for the Commonwealth Games. So, you know, we know the truth. But if they say in the papers it’s because of modernisation – it’s not. Q. [GM]: Can you explain, just imagining that people don’t know anything about the situation, where the Accord Centre was? And what was happening in terms of the overall development in the area? [GH]: The whole area, the whole area has been run down for probably…they’ve put all the houses down in that area, I think, say, probably ten years before that. The Accord, they pulled down the Accord. And they needed all that land for the Velodrome, and for the Athletes’ Village, and the bus park. Basically, the Accord Centre, if people ever visit the Velodrome, and there’s a…there will be…a new bus park behind the Velodrome. That’s where the Accord Centre sat, and that’s why it had to be pulled down. And 120 people, and more families, were affected by the closure of that, for the sake of a bus park. Q. [GM]: And they, in the letter, said that basically the Accord Centre has to go, because the Games are coming in? Q. [GM]: Okay, so can you tell us a little bit about the East End Carers Group, and how that started off? Was that in existence before this? Or was that your response to what was happening? [GH]: It was our response to when the then Director of Health and Social Care asked to speak to mums and dads from the Accord Centre, and to involve them in, you know, the planning of this new building. That’s why East Carers was set up – it was myself and a few elderly carers. And at that time, just the year before that, the Accord Centre had £150,000 spent on it, to modernise the building…within it. And we were involved in that, although not as a group, but as parents we were involved in that. You know, picking stuff, and suggesting, you know, lights, colours, whatever, along with the people that use the Accord. And then, the then Director of Health and Social Care, Mark Feinman, wanted to speak to carers, then we set up from there. You know, to look at land, and suggestions; how we’d want to see the centre, and all those kind of things. Q. [GM]: And what have you been trying to achieve with the East End Carers Group, in terms of getting new facilities there? And how are things? How have things proceeded? [GH]: The east end of Glasgow is the only area without a day centre just now. And these people lost it, and they were told they would get their new centre, and they’re getting pushed aside. And we, we can’t give up on that. We can’t give up on that. Our future as well, not just for our own children. Q. [GM]: Can you explain what the situation is? [HM]: They’re the most vulnerable people in Glasgow. And they’ve just been ripped off. You know what I mean? They’re getting ripped off right, left and centre. They were promised a legacy from the 2014 Commonwealth Games, and they’re still looking for this legacy. They want their own building, in the east end of Glasgow. Q. [GM]: How many people were in the Accord Centre? How many users were in it? [GH]: Were in it? 120. And there was a waiting list. Q. [GM]: Can you explain how all this disruption has affected people? You know, where people are at now? [GH]: Well, that’s the worrying thing. Once they closed the Accord Centre, the Council had brought forward implementing a Government policy called Self-Directed Support. And Self-Directed Support was supposed to be a choice; it was your choice to go through it. And Self-Directed Support is all about handing, putting people through an assessment, and giving them a cash sum, monthly, to buy their own support. So, what Glasgow City Council did was, most of, probably 98% of the people who stayed with provider companies, not their parents, not their family, provider companies – that’s who Glasgow City Council targeted first. Because it was easier to remove these people from the day centre. And they’ve left. Most service-users who live with parents, they haven’t taken on that in huge amounts yet, but they’re about to. Q. [GM]: When will that come into effect? [GH]: That’s within the next couple of months. Q. [GM]: And what kind of effects will that have would you say? [GH]: Massive. Carers will have to do more caring. And because of the Council, say the cuts and stuff like that, people who maybe used to have a five-day service from the Council will no longer be able to afford that. The Council and Social Work are re-assessing people to make sure that it’ll cost them less. So, say, somebody like myself, and my son, maybe receives a five-day support. And that allows me to either work or whatever, and my son to, you know, make friends, have friends, do different things, with reliable staff. That’ll not be there now, it’ll be, I’ll have to look for cheap care. And probably doing more caring myself. So, I don’t work during the day just now, but if I did work during the day, I’d have to give up my job, once he goes through this process. And I’ll be the one who has to buy in care, source care, police check people. I’ll be an employer. So all responsibility will be on me, on top of everything else. Q. [GM]: That’s terrible, isn’t it? And is that, that’s been wrapped out across…is that a Scottish policy, a UK policy? [GH]: It’s a Scottish policy, but Glasgow are doing it in such a way, no other Council is doing is doing it their way. They’re going hammer and tong at it, and I personally believe Glasgow City Council want to privatise social care in Glasgow. I don’t think Glasgow City Council want anything to do with it. Q. [GM]: Okay. So, getting back to the centre, where are the former users of the Accord Centre based at now? [MM]: Well, they’re based in the Bambury Centre. They go there and have a cup of tea in the mornings. And they need to…it’s shut off for 11 o’clock. It’s just hopeless though. I couldn’t really say much more about it, my daughter has downs syndrome…I’ve had to have her in the house the whole last year. Q. [GM]: So how does the Bambury Centre compare with the Accord Centre? [MM]: Just, it’s a bus stop, it’s a big room; they’re out all day hail, rain or shine. They’ve not got a centre if the weather’s bad, that they can go in and do something. Whereas when they were in the Accord they used to have music rooms and what-have-you. Now, they must go out, no matter what – even if they’re walking to the shopping centre, whatever. And to me thats not a day service – I’d rather just keep my lassie myself, which I do. Q. [GM]: Can you maybe explain what facilities were in the Accord Centre? [MM]: Well, they went in and they had tea, they had the canteen, where they could get a hot meal and that, at lunchtime, and go back there at lunchtime. If something was off they could stay in it through the day, play music. They had a sauna tub and what-have-you. A room they went in, that they could relax in. Q. [GM]: So has the timing changed as well? When could you use the Accord Centre before? What sort of time? [MM]: Any time from 9 to 3. And down there it’s from, I would say, 10 to 11. That hour to get a cup of tea, and out. The doors have got to be locked for 11. And they don’t get back to the back of two to get back in their buses for three’o’clock. Q. [GM]: So essentially there’s a massive, massive reduction in the service that’s being provided. Is there anything else anybody wants to say about the Bambury Centre? [GH]: The difference with the Accord Centre and the Bambury, as well, is in the Accord Centre people had, you know, physios coming in. You had, what’s the person that does the feet? Chiropodists coming out and seeing people. There were all different people coming in and out checking people’s health and stuff like that. [MM]: Counselling, bereavement counseling, all that’s stopped. [GH]: You know, rebound therapies they had in the Accord. It’s…the Bambury is… it’s the one room. The Accord Centre was quite a big building. This is one room we’re talking about that’s in the Bambury. Q. [GM]: And when they moved people to Bambury, did they say that would be a stop-gap? Or was that just what you were expected to accept? [MM]: It was actually a stop-gap until after the Commonwealth Games and that was when they thought they were getting the new centre. Q. [GM]: So should we talk about that then? [GH]: Community’s hardly used it from when they went in. Q. [GM]: Okay. So the Bambury Centre’s clearly inadequate to the needs of, not just yourselves’ and the Accord users, but also the wider community? [GH]: When they were closing the Accord, they got us to look at the, the Council got us to look at different community centres. All of them failed, because of access, and different floors, and stuff like that. Except for the Bambury. Because the Bambury you could walk straight into it, no steps. Now, every avenue led to the Bambury, and the reason being that Bambury was in big trouble. Right? Financial. Involvement with the police. Loads of things. But where the Bambury is situated [very close to the main Gmes sites], it can’t be seen to be failing, and it needed money. And that money was needed fast, because the Bambury was closed at the time. So, between the local Council, social work, and other councillors, I believe they came up with an idea, and the local housing, as well. So, Glasgow City Council, rather than put money towards the day centre, gave away £150,000 to that private housing association, so that they could buy the Bambury. Right? So, gave that money to the housing association, to take over the Bambury. Q. [GM]: What was the Housing Association? [GH]: West of Scotland. Then, Glasgow City Council gave them – was it £45,000 a year? Was it? How much was it to hire it for a year, £45.000? Then, Glasgow City Council, for the rent of that room, for five years, gave them £45,000 on top of it. Right? And the deal is Glasgow City Council [West of Scotland Housing Association?] got an option for 15 years on that, but only had to pay five years up front, so that’s like £200,000 they gave away. One room. One room. And that money is totally wasted, because now what’s happening is…we believe that the Bambury will be closing. Or, a private company will be coming in and taking over that room. So that we’ll buy private daycare off them. It’s failing, the Bambury’s failed. The café’s closed, people are out, the community’s stopped using it. The only people – and they’ve moved their shop inside it now, the local shop has been moved into that building as well, the other side of the Accord. Q. [GM]: Where is the Bambury Centre? [GH]: It’s right next door…across the road from the Velodrome. Q. [GM]: And you were saying that it couldn’t be seen to fail? [GH]: Can’t be seen to be failing. Q. [GM]: Why do you think that is? [GH]: Because of who the local councillor is, and because of how close it is to the Velodrome. And because of the, the situation within Barrowfield, it’s like…it’s one scheme, with two different parts, and the two parts don’t meet, and the Bambury’s in the middle. And if that building’s lying empty, within this enclosed area, across from the Velodrome, it’s going to get wrecked. Probably, possibly, young people with nothing to do, the usual kind of stuff. And that can’t be seen from London Road, across from the Velodrome, and next door to Celtic Park. Q. [GM]: …related to the Games, that you’ve been kind of bound up in? [GH]: The West of Scotland [Housing Association] bought it. [MM]: Aye. And we keep saying that, all that money that was wasted. And it’s never, ever picked up, and now liquidation, they say it’s going into liquidation again. It’s – that bit of the Bambury, it’s our kids are keeping that open. But then they if they go through SDS [self-directed support], what are they going to do with it? It’s a waste of money. [GH]: Because nobody, nobody will buy services at the Bambury. [MM]: It makes you sick…Well, I wouldn’t even send my daughter down there, so I’m definitely not going to buy her a service in it. If I’ve to pay for it. [HM]: Was it not actually GERA that was put into running that? Q. [GM]: This is Glasgow East Regeneration Agency? [HM]: Yes. There’s a big hush-hush about it. [HM]: Firearms. Yep…put the weans in there. [MM]: I’ve said I wouldn’t send my daughter down there. If there’s somebody down there waving a gun about? [GH]: If you look at the Scottish Government statistics on that area, you don’t need to say any more. [MM]: I actually went to a meeting there one night, and they’re talking about bringing the community together because it’s been a troubled community for years and years. It’s him that actually runs Scottish Housing…see if they could go in there to give them any tips to bring the community together. And they couldn’t get anything. But they thought taking our kids in there would bring the community together! That’s not what my daughter was put on this earth for. I think it’s a dangerous place, and she’ll never go in. And it’s not brought them together, anyway. [GH]: And the cashflow behind them has been used. [GH]: They want them in community buildings, but they don’t want them in, you know, leisure centres or sports centres, all the fancy new places. They don’t want them in there. Do you know what I mean? That’s, that’s my community. You know. That’s the community building I use. I don’t use the local community centre. Q. [GM]: I know that your experiences have been very specific to these centres, but what would you say in general about the level of community services in the east end? Because just passing through a lot of community buildings, it looked to me like a lot of them were quite small, kind of inadequate buildings – would you say that’s the case? [GH]: They are small, and they’re very few. You go to the local library, you can’t get a computer in it. [HM]: Plus, we hire the library, and we’ve hired it for a few years now, and we’ve always had the downstairs room in the Parkhead Library. It was shut for a wee while, to get painted, ‘modernised’. So, that’s near enough a year and a bit, isn’t it, it was closed. And it opened back up. So we thought we would get that same room, bottom floor – eh, no! They’ve put us upstairs, flights of stairs, now. You’re talking about carers, and people with learning disabilities. How are they to get to these rooms? [GH]: Unless you’ve got money up-front to book six months ahead and stuff like that, you’re not going to get a room to book. You know? Q. [GM]: That just seems to indicate that there’s a lack of space across the area? [HM]: You look at the areas that Parkhead Library takes in. And then look at the new library at Bridgeton. It’s all high-tech. Loads and loads of computers. [HM]: Whereas at Parkhead, which takes in a bigger area, they’ve got, say, seven, eight computers, and two computers for children. [HM]: Well, that’s en route to the Velodrome. That’s en route to the 2014 Commonwealth Games area. [MM]: Actually, the Parkhead Library, I didn’t even know that it was shut on Fridays. I never noticed any difference. Q. [GM]: I suppose with the Games, one of the things that the people behind it will claim is that, you know, it’s for the general good. So the general public good, and that, you know, there might be some disruptions locally, but…How would you respond to that? [GH]: Well, the jobs and all that supposed to be for local people? [HM]: Well…I’ve got a son of 18, and he can’t even get a job in it. He’s no worked since he left school. He’s done training programmes; he’s done that many training programmes that he can’t get on any more, so he’s actually unemployed. And for an 18-year-old boy to be unemployed that long, it’s, I mean, it’s shocking. The promise of these Games is the apprenticeships…where are they? Because none of the young ones I know, and my boy’s friends; they can’t get them. [MM]: I’ve stayed here all my life, and I don’t know one person from here that works on the Commonwealth Games site. Q. [GM]: That’s amazing! So, in terms of…so you both see that in terms of the general experience…? [MM]: Except one night when we were down at a meeting, and George Redmond was there, and a couple of boys that he knew were saying how great it was. And Yvonne Kucuk [local councilor] was standing up and going: there’s Stephen at the back, I’m very proud of him and whatever…it was her nephews! So their family’s in, but I don’t know any of the other local boys, except for families, if they’re from councillors or whatever. Q. [GM]: And you were saying that your son has already been through lots of training programmes? [HM]: Yes. But never one in the Velodrome. Q. [GM]: But the training programmes, then, haven’t led to anything? [HM]: Nope. No jobs, nothing. Q. [GM]: How long did they last, do you know? Or what type? [HM]: Six months. Work experience in factories. And nothing has ever come out of that. He’s constantly at the careers office. He’s constantly at the Job Centre. And there is absolutely nothing. What is it they say? He’s part of the lost generation now. When will he get a job? The future doesn’t look great for him. He’s actually been offered volunteering work in a charity place, and he says no, because it’s part of the workfare programme – you work for your giro. And because he said no, he actually got sanctioned. So, he’s had no money. And this is the east end of Glasgow, where millions, millions, are getting spent on the Commonwealth Games, and there’s not, there are no jobs for the locals. It’s shocking. Q. [GM]: In terms of his friends, and the people he knows, is that a similar kind of experience? [HM]: Same. Similar experience. And who out of them have got jobs, it’s their parents that have got them jobs – in beside them. And whether these jobs last, I don’t know. It’s just unfair that all this money’s getting put in this area and there’s no jobs. Q. [GM]: And one of the other things was that they were talking about housing. You know? I think 10,000 houses within the area as part of the Commonwealth Games and the Clyde Gateway regeneration: have they appeared? Or, what’s been the experience of that? Or, what kind of housing has it been? [MM]: They have put up new housing, but then a lot of them [local people] are complaining, because they were sitting in the middle of the work, weren’t they? And they did put a thing round saying, one offer only, that they’d get their windows washed, or their motor washed, whatever, because of all the muck and dirt. And we have spoken to a few people, spoke to people up at Parkhead, and they’re shouting: ‘Well, I could wash my windows every day, and it wouldn’t make a difference”, so it wasn’t so good for them. And they broke up a community, didn’t they? They broke up the whole of Dalmarnock. [HM]: I mean the only new housing I know of is the Athletes’ Village, and that doesn’t get handed over until after the Commonwealth Games. Don’t get me wrong, they’re beautiful houses, but if you don’t come from that area, you’re not going to take a house in that. And how many are social housing? Q. [GM]: So the Bambury Centre’s clearly inadequate for your needs, and for anybody else in the community. Can you tell us a little bit about the other options? [GH]: In Glasgow Central. Never in our wildest dreams did we think that he would turn away from us. Never. Never. We wouldn’t have went to the bother of being there, if we thought that. And then…I think, I dunno who mentioned to us…well, the Commonwealth Games, that’s the Scottish Government, right? It’s [The Games] wanting your land that the Accord’s on. So, then we, I think we wrote to, did we write to the First Minister? I can’t remember how it came about. And then the First Minister asked to meet us, then, didn’t he? So we went out there to meet him. And then, he said; he said in that meeting that the Scottish Government give 80% towards; the money towards the Commonwealth Games, and Glasgow City Council’s 20%. And they [the Scottish Government] can withhold, if they want to. Right? And then…then what happened? [MM]: We were actually having a meeting up at Parkhead, and Helen’s sister’s was coming down to it, and told us Alex Salmond was at The Forge [shopping centre in Parkhead]. So we went down there and saw him. And we told him we were having a meeting – he said he’d pop in; which he did, him and John Mason. And then from there, he said he’d come down to Accord to see. Cheryl asked him. He’d come down to the Accord; he promised her that he would. [GH]: And he come down here; he says “if I win this, if I get this election, I’ll be down, it’ll be one of my first things I’ll do”. And he was true to his word, it was one of the first things he did. I think it was two days after he was made First Minister, he came down to the Accord. [MM]: My daughter. But she’ll tell you about that, she went. [Cheryl McCarthur]: I went and voted for Alex Salmond. And I thought he was going to help us. But I know that he wasn’t. And, because it was the time to vote. [GH]: See when he came down to the Accord Centre, how did you feel when he said he would come and meet all your pals and all that? [MM]: What do you think now? Do you think you’ll still get your centre? [CM]: No. No chance. And I want a day centre. So that I can see my friends. Q. [GM]: How do you feel about that now? [CM]: Angry. And upset. Because I like to see my friends, Neil. Q. [GM]: That’s fair enough. [HM]: Cheryl, say your name. [CM]: I’m Cheryl. My name’s […] McCarthur. [GH]: And did you used to go to the Accord Centre? [CM]: I used to go to the Accord. Q. [GM]: Did you like the Accord? Q. [GM]: What was good about it? [CM]: I loved to go in the Accord, because all my friends were there. And people I know from primary school, for 21 years. Like Michael, and that. And drama. We used to do drama. And, my drama teacher knew David Meldrum. He was the best drama teacher. Doing shows and that. And I like acting. And he got everybody to see us. But…all that stopped, because of the funding. No money. And I think it’s sad and upsetting. But, we used to go to…two drama teachers we had; that’s David and Michael, who used to have cars. And we used to go to the other drama, down to Knightswood. To get us there and get us back home. But, but now that’s stopped. And now we couldn’t go. I’ve been back; my mum took me there. And, on the Fridays, and we did the last show. That was…we did a Peter Pan show. And I loved it; and I met some new people from this opening. And I enjoyed it, and I love acting. And now it’s all stopped, because there’s no money, no funding. Q. [GM]: What do you think of the Bambury Centre? [CM]: It’s not a centre for me. I want a day centre. I don’t want to go to a community centre; I want to have a day centre with my friends. And I want my drama back. [GH]: Did you ask to go to another centre, when they said that you had choice? [CM]: Yes. I asked for, we had a visit to the Riddrie Centre. I asked: can I go to the Riddry? And John Simpson says “no, because it’s too many, because all the wheelchairs need to go there”. I think it’s not fair, because we need; that’s no fair because all of us needs a centre as well. Q. [GM]: What would be, what would be your best option, if you could choose? What would you like, where would you like to go? [CM]: A day centre, with my friends. And I want my drama back. That I can go to. [GH]: If you had a chance to go tae the Riddrie, or the Bambury, or wherever, where would you go? [CM]: Because all my friends is there, goes there. [GH]: What’s the difference between the Riddrie and the Bambury? [CM]: The Riddrie has more people I can mix with. And the Bambury is not for me. It’s a community centre, and I don’t want a community centre, I want a day centre. Q. [GM]: Can we go back to the Alex Salmond question, then? So, Alex Salmond, he came to the Accord Centre, can you tell us a bit about that please? [MM]: He came to the Accord. He met the kids. Asked them what they were doing, just as Cheryl says, about the drama; which he seemed to be very interested in, says he would love to see one of the shows and whatnot. And they were all as happy as Larry; thinking he says, he’d try his best to get – before the Games – a like-for-like centre. Which never happened. And after that, he just fell away. Q. [GM]: So did he make any assurances, or verbal promises to you? [GH]: Yep. Yep. He’d set up for East Carers to be involved with someone that Scottish Government hired. He was actually the ex-Director of Social Work, South Lanarkshire. In South Lanarkshire, they had started modernising their day services -day centre services. And what they had done out there was new buildings, or community buildings were getting built. They had the day centre within them [Harry Smith Complex]. And it was a partnership with Health, Social Work, Council. Everyody involved in making this work. And he suggested that we go out there and have a look. So that’s what we did. And we went to see: they’re all fabulous out there; absolutely fabulous. And it is inclusion. You know, there’s no separate doors, there’s no, you know, nothing like that. All they had was a, maybe a separate area where, the day centre part is. But most of the time people mixed, the whole community mixes within the sports centre. Absolutely stunning, fabulous, and – that’s how you see your 21st century! [HM]: That is modernisation of the day centre. [GH]: For learning disabled people, you know, they’re not, they’re not hidden away, in, you know, a room in a community centre, within a community that’s actually not like…nobody else uses that community or even walks through it. So, we were absolutely stunned, and couldn’t believe that Glasgow is nowhere near that. It absolutely, it blows your mind to see how fabulous it is, and how it works. Everything. So, Alex Salmond said, in one of his letters, (here and here) that he would like to see a Harry Smith style day centre complex within Tollcross Aquatic Centre. And we have a letter saying as much. But…Glasgow City Council are saying absolutely no way is that going to happen. Glasgow Social Work department are saying: our staff will not be in there. We will not be putting staff in there. So it’s very difficult, because you’ve got the First Minister of Scotland saying what he wants to see happen, to these people who had their building, you know, pulled down for a bus park, for the Commonwealth Games…have been left with nothing but a hired room. You’ve got Glasgow City Council -and Social Work – that’s what’s surprising: how can Social Work not be all for this? And it’s just; they’re just so opposite in their ways of thinking. It’s like Glasgow City Council are holding back progress, whereas personally I see the First Minister and the Scottish Government trying to, trying to progress. But Glasgow City Council are regressing. And what Glasgow City Council are doing, they’re not just regressing the services, they’re regressing people’s view of learning disabled people. And that’s what’s really, really bad. Really bad. [MM]: I feel like that an awful lot; I feel as if they’re using our kids as a political football. They’re actually…as if they’re getting one up on one another. I mean, my kid can actually go [to speak to them – the Council? ]; they say “go and ask Alex Salmond”. I mean where do you go with […] someone, who can actually say things like that? Q. [GM]: Did he actually say that to you? [GH]: Aye. He actually screamed at us, from the top of his voice, inside City Chambers, in the meeting: ‘go and ask Alex Salmond for forty million pound!’ And we’re standing there going, ‘what? !’ [laughter] But see, the way we see it is, we just see it as, you’ve got your local council, and then you’ve got your Scottish Government. We didn’t see it as, there’s this one and that one, and they belong to this and that. We just saw it as, well, you know, like Scottish Government’s at the top, and then it comes to councils, and then it’s our local councillors, and then – we didn’t see it the way they see it, and the way they are – we didn’t see it like that. [HM]: It’s opened our eyes to politics. [MM]: Before that, you just went about your business everyday, you did this and that – voting came up, you went and voted. Didn’t think we’d be doing what we’re doing today. We have marches – do you know what I mean? Campaigns. It kind of takes over your life. Doesn’t it? And the more you hear; it doesn’t make you feel any better. [GH]: I wish I knew nothing. I wish I knew nothing. If I was, if my son didn’t have a learning disability, I would be ignorant like a lot of people. [GH]: Sometimes people say ignorance is bliss. I think it used to be. It’s a horrible thing to say, but I think it’s quite a; I think it’s quite a selfish society we live in. I do. [HM]: Especially where politics are concerned. [GH]: You know, I think, if it doesn’t, ‘if it’s not within my family, doesn’t matter to me, then I’m not interested. That’s what I think’. [GH]: That’s what I’m saying. Q. [GM]: You have children with such obvious basic needs, that require assistance, and they can’t do that. I mean, how does that make you feel? [GH]: Well, that’s how I say […]. Because probably, I don’t know, eighty years ago, or whatever, you know, when people had children with a learning disability, special needs, disabilities, whatever, they were encouraged not take them home, or…maybe, maybe they didn’t understand themselves. So, it was the given thing, you just didn’t take that baby home. So they went to institutions. Because there were no supporting structures there, to support a mother, and a father…you know? Because even a mother and father can have two different views on having a disabled child when it’s born. And then, if the family then had other children, you, you can’t give your all to one, and, you know, totally wipe out your other children. So, obviously, as this country’s moved on…they’ve started supporting families, people that had babies. But basic..I mean, see if you even think about it, it was only, what, early 1980s; learning disabled people were entitled to an education. The early 80s! [ironic laughter] Do you know what I mean? Now that’s shocking itself. And now the institutions aren’t there, because supports are in place, for families, when they give birth. You know, you’ve got the social work, and all the health visitors, and all these different medical staff, you know. So it’s like, it’s bringing things forward. And then Glasgow City Council are taking a huge leap back. Because without the support in adulthood it’s very, very difficult. [MM]: That’s what I keep saying. Cheryl went to the centre, don’t get me wrong, she went, she loved it, if she’d ever said to me once, ‘I don’t like this’, we’d have left. Cheryl actually loved going there. She’d have gone seven days a week, never mind five days. And the thing is, the older she gets, the more she needs a centre. [GH]: Glasgow City Council don’t take into account their health. [MM]: Because she’s going through, she’s 34, and she’s going through the menopause, and whatnot, and that’s what a lot of people don’t know. It’s how they age quicker as well. Most of them have heart problems, and what not. And they keep saying: ‘they’ve only got Downs Syndrome’. How can you only have Downs Syndrome?! [GH]: You don’t. I know. [GH]: Trust. I mean, you ask any parent, any parent with their, say, two-year-old child, say, ‘someone’s coming to pick them up. Just hand them over.’ Are you going to do it? [MM]: Whereas, if they’re in a centre, you know the staff there, they’ve all been there for years, they’ve […] and you know they’re safe. Safety’s the most [important] point, for my lassie. If I know that she’s going out, and she’s safe. Q. [GM]: Yeah. That’s, would be […] for everybody, you’re exactly right. [HM]: …Just, doesn’t care, are no looking out for the most vulnerable. [MM]: They’re actually saying they’ve spoke to them [service users] at the centres, and they’re telling them what they want. I could talk to Cheryl in the next five minutes, into doing anything that I want. [MM]: My lassie’s 34, and if she does something, she goes, ‘Am I a good lassie, ma? Was that good, did I do that right?’ You know the way? They want to please everybody. So they’ll say anything they want them to say when they’re coming out. There’s some of them who go to the centre that’s, like Morgan’s boy? Now he’ll come in and say: ‘Listen, I’ve told them I’m not going back in that centre’. And he might stay after the next day, and then he might stay after the next day, or else he might no want to go in the next day [laughter]. It’s just that kind of way. Q. [GM]: So where are we at now? In terms of you being given this promise, on paper, and verbally, of a ‘like-for-like’ replacement, and that you would have a Harry Smith-type complex, this very, very good facility, that there would be a facility like that in the Tollcross Leisure Centre. [GH]: Where we’re at now is, we met with the director […], it was suggested that Michael Matheson, the government Minister for Health, was meeting, we were told he was meeting with Councillor Mackie, and I think, I don’t know if Gordon Matheson was there, and the Director of Social Work, David Williams. So, and then, we would be, we were to get an update from Michael Matheson, from that meeting. And I actually can’t remember if we got an update. But leading from that, anyway, the Scottish Government suggested that we meet with David Williams, in a meeting, and the people, whoever are running the Tollcross Aquatic Centre – Glasgow Life people. So we did that a couple of weeks ago. Director of Social Work, David Williams, said there would be absolutely no Social Work staff within the Tollcross Aquatic Centre. That will not be happening, and it’s a sports centre, always going to be a sports centre, and that’s its intention, the building. But let’s not forget it’s a building with a community building within it – the old Shettlestone Halls. So, we said to him, well that’s not what’s getting said to us, or getting made out to us by the Scottish Government. And, so we suggested to him that we’re going from that meeting, and we’re after a meeting with himself, David Williams, the Director of Social Work in Glasgow, Gordon Matheson, or Councillor Matt Kerr, whoever, and Michael Matheson, this Scottish Government minister. So, we haven’t heard word back yet. Because we’ve got the Scottish Government saying one thing, and Glasgow City Council saying another. So if they manage to meet together, then us being at another meeting is not going to make any difference. However, David Williams did say, in that meeting, ‘oh, that’s too political; I can’t get involved in that.’ But, he was in on the other meeting with them. So, you know, you know – they shout, ‘oh, it’s too political,’ when they want out of something. But he was in the first meeting with Michael Matheson, and obviously Councillor Kerr and Gordon Matheson. [MM]: And we wish that it wasn’t ‘political’, for we don’t want it to be ‘political’. [HM]: And you’re talking about David Williams, the Director of Social Work. The new Director of Social Work. David Crawford has resigned; he retired! [GM]: He told us, he was in the meeting with Michael Matheson, the government person…and Councillor Matt Kerr. So when we said, ‘well, do you know what; we want to have that meeting there again, only we want to be there.’ He said, ‘oh, I’ll not be there, because that’s too political.’ So this is what we’re waiting on. Q. [GM]: So, in all this, what would be your, what would you like to see happening now? How would you like this to move on, so that you can get the facilities you need? [GH]: It would have to be within the Tollcross – the space is there. There’s everything there. There’s no stopping it, the only thing that’s stopping it happening is Glasgow City Council…is stopping it happening. Q. [GM]: And how do you think…. [GH]: Because there’s money there. Scottish Government’s already put up money towards it. And Glasgow City Council were trying to get their hands on it for toilets, and that’s no happening. [GH]: Toilets – for disabled people. [GH]: No, they’re wanting the money, Scottish Government have put £150,000 or £170,000 forward, towards the planning, well towards the building of a new Accord Centre. And it’s sitting there. [GH]: It’s ring-fenced. It can’t be used. [HM]: Shouldn’t be touched, or used. [GH]: But Glasgow City Council have been trying to use it, or Glasgow Life have been trying to get their hands on it, I believe. And that’s what that meeting was about, for disabled toilets. Q. [GM]: Throughout the city? [GH]: Well, yeah, well, they want to do them in Maryhill or somewhere like that. So. Q. [GM]: In terms of getting some kind of solution, how do you think things could be worked out? What would you like to see happening? [HM]: I mean, with the 2014 Commonwealth Games next year, that would be a showcase, if that was done in the Tollcross Aquatic Centre. It would let the whole world know what Scotland and Glasgow were doing for people with learning disabilities. Because they would take that back, and say how wonderful that is over here. [HM]: That would be a legacy. That would be their legacy. [GH]: It would show how forward-thinking Scotland is as well, wouldn’t it? You know what I mean? Because, there’s always things on the news, look what these people do with their learning disabled people? – and look what they’re [the Council] doing! Now! Do you know what I mean? And I’ll get a camera, because it looks no different in one of those foreign countries than it does in some of the places I’ve seen. [HM]: It would put Glasgow and Scotland on the map. Saying that they care for people with learning disabilities. And with the Yes campaign, it would make it even more wonderful. [GH]: But it should be, it doesn’t matter who you are. You matter. [HM]: Glasgow, Scotland: The caring city [silence]. [GH]: No saying that yet. [HM]: 2014 Commonwealth Games legacy for learning disabled. Q. [GM]: Will we leave it at that? [GM]: Okay, thanks a lot for your time.